Rumors are swirling in early 2014, and the first ones you should be taking seriously are regarding three new Olympus micro 4/3 lenses. Images have leaked, so it's almost a sure thing that they will be announced in the coming weeks. 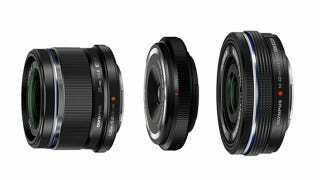 The first new lens is a 25mm f/1.8 lens to add to the already impressive collection of Olympus fast primes. This one has a full-frame equivalent focal length of about 50mm, so it should be a perfect everyday 'walking-around' lens. Next up is a pancake zoom—14-42mm f/3.5-5.6. It's kind of a bummer to see Olympus slog out yet another slow kit zoom, but this one's very slim profile will make it perfect for beginners or those looking to keep things super small and versatile. Finally we have a follow up to the oddball 'body-cap' lens that Olympus released last year. This one is an 8mm f/8 fisheye. Don't expect the image quality to be very good, because lenses like this were only meant as a kind of fun and cheap alternative to keeping a body-cap on your camera. The fisheye aspect definitely makes it stand out though.